Association of Bi-State Motor Carriers created the PDF documents below (in English and Spanish) to explain the upcoming traffic shift and signage to their truck drivers. This past Friday, October 23, 2015, public outreach efforts began to disseminate information about the forthcoming traffic shift which will be fully implemented on November 9, 2015. A new pamphlet began circulation around Bayonne residents and businesses in the project vicinity, including several extra copies placed at Value City Furniture and QuickChek on E. 53rd Street. This new full-color, two sided pamphlet is available here for download and printing by clicking the link below. Construction on the new east Toll Lane began this week. Individual (single) Toll Lanes will be closed nightly, 8:00PM to 5:00AM M-F, will continue through the week of 10/26/15. Ramp from westbound HCE to Toll Plaza will be shifted onto new pavement and a new median work zone created the week of 11/02/15. Northbound Avenue E traffic has been shifted to a new alignment, east of the Connector Bridge, between E50th Street and the Toll Plaza. The left turn at 53rd Street is no longer available. Traffic from Port Jersey Boulevard to the Turnpike cannot make a right turn onto the service road at 53rd Street. THIS IS A MAJOR TRAFFIC SHIFT. CLICK HERE FOR PAMPHLET. Individual (single) Toll Lanes will be closed nightly, 8:00PM to 5:00AM M-F, will continue through the week of 10/12/15. Eastbound 53rd Street will be closed at Avenue E (Toll Plaza) at midnight on 11/06/15. Access to local business will be maintained. Westbound 53rd Street from the Toll Plaza will not change. The Eastbound closure is expected to be in place for six (6) months. This is a major traffic change. CLICK HERE FOR PAMPHLET. Ramp from westbound HCE to Toll Plaza will be shifted onto new pavement and a new median work zone created the week of 10/26/15. 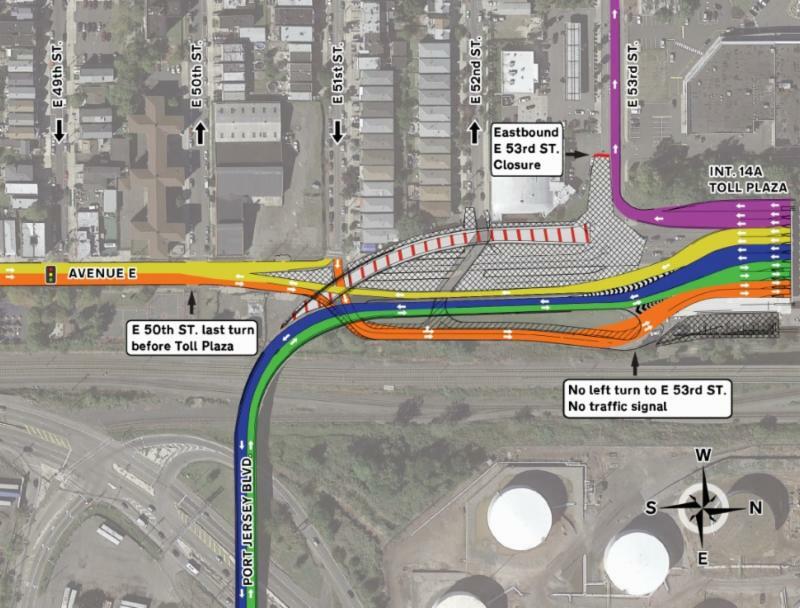 Northbound Avenue E traffic will be shifted to a new alignment, east of the Connector Bridge, between E50th Street and the Toll Plaza. The new alignment will be in effect on or about 10/23/15. The left turn at 53rd Street will be removed. Traffic from Port Jersey Boulevard to the Turnpike will no longer be able to make a right turn onto the service road at 53rd Street. This is a major traffic shift. CLICK HERE FOR PAMPHLET. Eastbound 53rd Street will be closed at Avenue E (Toll Plaza) at midnight on 11/06/15. Access to local business will be maintained. Westbound 53rd Street from the Toll Plaza will not change. The Eastbound closure is expected to be in place for six (6) months. Traffic from the Toll Plaza to Port Jersey Boulevard and Route 440 will be shifted left (east), onto the existing (one-way) bridge in a two-way pattern during the weekend of 11/06/15 – 11/08/15. Southbound Avenue E will be shifted to the east on 10/12/15 to allow for deep foundation work. Temporary widening of the existing bridge structure is being performed. This work will be supported by Bayonne and State Police as necessary. Northbound Avenue E traffic will be shifted to a new alignment, east of the Connector Bridge, between E50th Street and the Toll Plaza. Due to this new alignment, making a left turn at 53rd Street will no longer be possible. 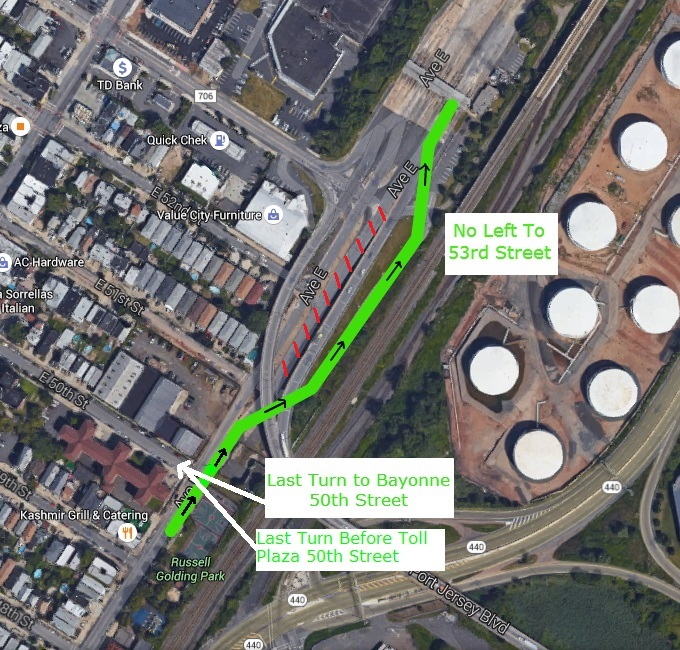 The last left turn for Bayonne before the Toll Plaza will be at 50th Street. Traffic from Port Jersey Boulevard to the Turnpike will no longer be able to make a right turn onto the service road at 53rd Street. West side (exiting 14A): construction continues on the new toll lane and toll island. The new Toll Lane will be activated the week of 10/05/15. East side (entering 14A): renovation of existing Toll Utility Building building will continue. Individual (single) Toll Lanes will be closed nightly, 8:00PM to 5:00AM M-F, and this will continue through the week of 10/12/15. New Communication Building has been activated. Ramp from westbound HCE to Toll Plaza will be shifted onto new pavement and a new median work zone created the week of 10/19/15.